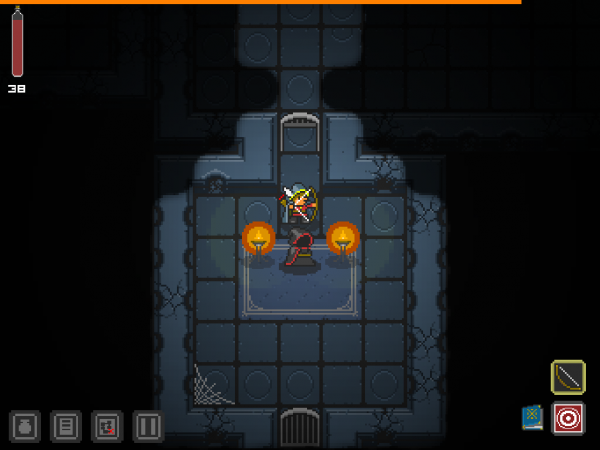 Quest of Dungeons is a very challenging, procedurally generated RPG that knows exactly how tough it is and revels in it. All the light in the land of Virul has been trapped in a lantern by an evil wizard in the ruins of the old Omphar Mansion. Only a single explorer is brave enough to enter and seek the light! Quest of Dungeons does not forge very much new ground in the realm of dungeon-crawling RPGs, but all of the ground it covers is familiar, fun, and clearly loved. From the very beginning, it's hard. The characters who encourage the antagonist to go it alone are not far off when they joke about the player's imminent demise. However, once bearings are gathered and a few characters have been burned through, prepare to play a game that is exactly what an RPG should be. There are four character types with few surprises. The warrior deals in short range attacks and muscles through enemies. The wizard utilizes a nice variety of magic spells. The assassin's weapon of choice is a long range bow with some short range tricks. Finally, the shaman fights at a closer range but with some nice area magic. Given that the game inflicts permadeath, there is plenty of opportunity to explore all four types. Gameplay is turn-based. Simply tap a floor tile and the game figures out the "turns" that occur to move enemies in conjunction with the antagonist. Each level is procedurally generated so each playthrough presents a unique experience. The dungeons are rather full, filled with shadowy shopkeepers, rats, bats, beasts, and some rather sarcastic bosses. Quite a bit of strategy begins to develop as the character learns more and more skills and spells. While the gameplay is quite smooth, the controls can feel a bit cumbersome. 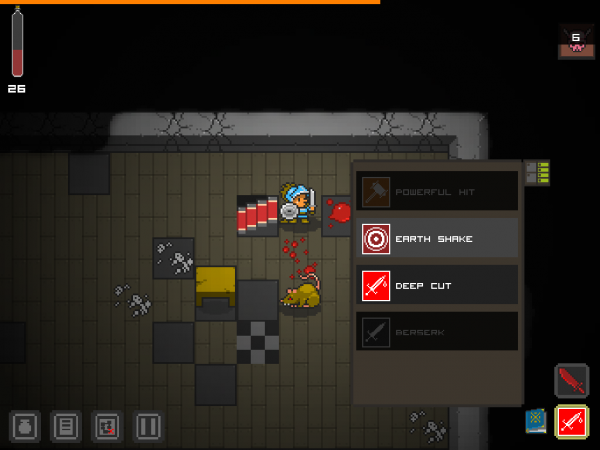 In order to move the character's melee weapon must be selected, as spells are cast while stationary. An errant tap may bring a character up short or send them running to the wrong tile. In a similar vein, transitioning between the main screen, items screen, quest screen, and map screen can be a bit annoying - especially when the players find themselves searching the level for that hiding shopkeeper. Also, when the item screen is open the character is still free to move! Moving about the levels of the Omphar Mansion requires a bit of extra care and attention beyond simply avoiding that nasty boss shouting "YOLO"! Graphically, the game is beautiful. Classic 16-bit artwork lends everything a nice retro feel while a good use of the color palette keeps enemies, objects, and the hero nicely distinguished, even in darker dungeons. Very pleasant music accompanies the player as they delve into the dungeon; until they are attacked, of course. Well done sound effects add to the overall excellent ambiance of the game. Quest of Dungeons is a very good procedurally generated RPG, which is exactly what it sets out to be. Quality gameplay combined with great artwork and nice sound makes for a great, if challenging, playing experience. As they say, practice, practice, practice makes for a slightly longer game!